The study was conducted in Burdwan district, popularly known as rice bowl of West Bengal. Study aimed at assessing factors responsible for change in use of technology in rice cultivation of Burdwan district. Ex-post facto research design was employed for the study and was conducted in one of the highest rice productive district by taking 60 rice farmers as sample. 30 technologies and 18 factors were taken for analysis and stepwise logistic regression analysis was employed for identification of significantly contributory factors. Variables like age, social participation, size of holding, extension contact, risk orientation, achievement motivation (positively) where as family size, satisfaction with life, types of land holding (negatively) contributed to change in technology use in rice cultivation. So study has come up with some concrete suggestion regarding accelerating technology use in Burdwan district. Diwakar, M.C. (2009), Rice in India during Tenth Plan, Directorate of Rice Development, Patna, State Directorate of Agriculture. Evans, L.T. (1998), Feeding the Ten Billion: Plants and Population Growth. Cambridge University Press, Cambridge, UK, pp. 247. Ghosh, B.K. (2009), Identification of backward districts in West Bengal: Implications to balanced agricultural development. ICFAI Univversity J. of Rural Manag. 2:64-72. Anonymous (2011), Agricultural Statistics at a Glance 2011, Ministry of Agriculture, New Delhi. Greenland, D.J. (1997), The Sustainability of Rice Farming. CAB International, Wallingford, UK. pp.273. Hossain, M. (1995), Sustaining food security for fragile environments in Asia: Achievements, challenges, and implications for rice research; In: Fragile Lives in Fragile Ecosystems. IRRI, Los Baños, Philippines pp.3 - 23. Jamala, G.Y. ; Shehu, H.E. and Garba, A.T. (2011), Evaluation of factors influencing farmers’ adoption of irrigated rice production in Fadama soil of North Eastern Nigeria. J. Develop. and Agricul. Econ, 3:75-79. Khan, M.A. ; Sharma, R.C. and Sharma, P.N. (1997), Farmers characteristics and adoption of paddy technology by eastern M. P.: A path analysis, Journal of Extension Education, 8:1800-1807. Mcguckin, R.H.; Streitwieser, M.L. and Doms, M. (1998), The effect of technology use on productivity growth, Eco. Innovation and New Technol., 7(1),pp.1- 26. Narayangowda, K.; Jayaramaiah, K. M. and Gangadharappa, M. R. (1991), Socio-psychological factors associated with knowledge of contact and follower farmers in T and V system. Maharashtra J. Ext. Edu. 10,pp.212-215. Padaria, R.N. ; Singh, B.; Sivaramane, N.; Naik, Y.K. 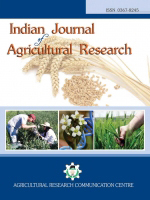 ; Modi, R. and Surya, S. (2009), Logit analysis of Bt cotton adoption and assessment of farmers’ training need. Indian Res. J. Ext. Edu. 9(2), pp. 39-45. Rabari, S. N. (2006), A study on adoption of tomato recommended technology by tomato growers in Anand district of Gujarat state, M.Sc. (Agril.) Thesis, AAU, Anand. Sujatha, P. and Annamalai, R. (1998), Differential adoption behaviour by different categories of farmers and their characteristics associated with adoption behaviour. Journal of Extension Education, 9(1), pp.1905-1908. Vasava, J. M. (2005), Knowledge and adoption of recommended pigeon pea production technology by pigeon pea growers, M.Sc. (Agri.) Thesis, AAU, Anand.